Every empire has a cultural rival that both terrifies and fascinates the populace. During Rome's tenure as a Mediterranean superpower, the city had more than a few epic rivalries with its neighbors. Only one was so terrible, so frightening to the Roman people that upon its final defeat the Romans sowed the land with salt so no one could live in the city again. Carthage is a city only relatively recently excavated, and often misunderstood. The Roman slant in historical writings either give Carthaginians legendary superpowers as opponents, or relate their barbaric and foreign ways as justification for conquest. Early archaeologists looked on the city and culture from a decidedly Christian point of view. A graveyard of infant bones became proof that the Carthaginians sacrificed babies. Statues to Ba’al and other deities brought over from Phoenicia painted them as, again, barbarians. For centuries, Carthage existed in literature as a mythical city in moden Tunisia inspiring both awe and horror but not many facts. 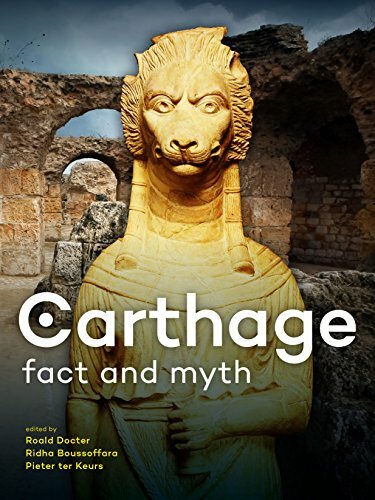 Carthage Fact and Myth is a beautiful effort to provide a real peek into ancient Carthage from a whole-world perspective. Edited by Roald Docter, Ridha Boussoffara, and Pieter ter Keurs, this collection of essays spans every subject of ancient Carthaginian life. Their origins and expansion throughout the Mediterranean, their religion, their daily life, their ways of war, their legends, even their advances in ship building are all covered by the historians contributing to the book. This is decidedly written as a coffee table book, intended to kindle an interest in the UNESCO World Heritage Site and give the reader enough of both history and legend to find out more. The writing itself is varied in style due to multiple contributors, but every chapter is both easy to read and engaging. The topics vary depending on the authors' areas of expertise and are introductory, so a scholar looking for in-depth detail will only find a jumping-off point for further research. Well written as it is, truly it’s the photography and artwork that make this a fantastic book. Pictures of archaeological sites and Carthaginian artifacts from museums all over the world, and artwork depicting various interpretations of both history and mythology do more to bring ancient Carthage alive than any text. Included is a thorough index of resources for further reading and museums to view Carthaginian art. Carthage Fact and Myth was a fascinating read and a gorgeous glimpse into Rome’s ancient adversary. Settergren, Jessica. "Carthage: Fact and Myth." Ancient History Encyclopedia. Last modified January 01, 2016. https://www.ancient.eu/review/96/. Settergren, Jessica. "Carthage: Fact and Myth." Ancient History Encyclopedia. Ancient History Encyclopedia, 01 Jan 2016. Web. 18 Apr 2019.